Spend the weekend helping Ontario Nature restore native habitat at Cawthra Mulock Nature Reserve. 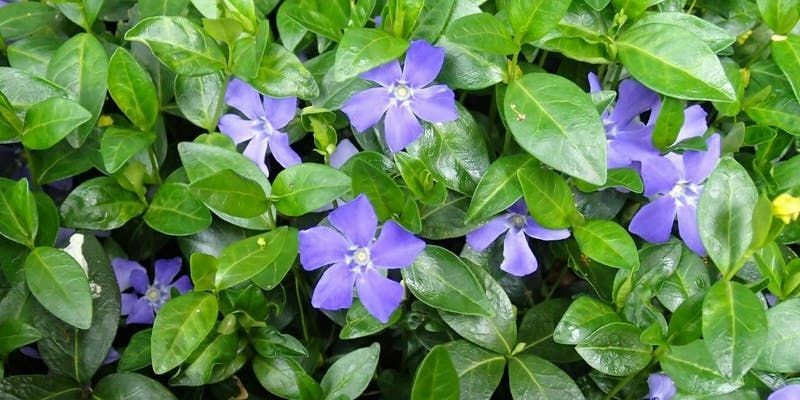 Periwinkle, a non-native invasive species, creates dense monocultures on the forest floor and out-competes native species. To prevent its spread, come roll up your sleeves and get your hands dirty pulling this pesky plant! The day is divided into two sessions: 10am – 12pm and 1pm – 3pm, with a 1 hour break for lunch from 12-1pm. Come for one or both sessions. Meeting Location: Directions using Google maps. To access the east entrance, travel north on Bathurst Street from Green Lane/Millers Side Road. The nature reserve is the second driveway on the left (west) side at 18462 Bathurst Street and is marked by a green and white Ontario Nature sign. Please meet at the parking lot at the end of the access road off of Bathurst Street (East Entrance). Continue driving past the house down the access road, the parking lot will be at the end with space to turn around. To Bring: Please bring a bagged lunch and re-fillable water bottle. Remember to wear long pants and closed-toe shoes. Some gardening gloves and trowels will be provided, but please bring your own if you have them.